"É-X-I-T-O by Joe Kutcher, Hilda Garcia, and Alonso Fernandez (in Spanish)"
How can your company use Facebook, Twitter, your website, mobile phone, and social media tools to sell your products? 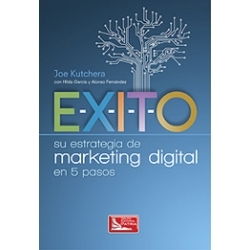 Read this book (written in Spanish) to find out how you can develop a customized content plan that can attract your audience to your website and social platforms. Various marketing planning methods, such as the four 4 P’s (place, price, product, promotion), already exist. Nevertheless, in the twenty first century we need a new model for creating successful marketing strategies that incorporate new technologies, innovation and content marketing. In addition, we need a model to reflect the rising importance of Latin America. This book provides readers with stories which outlines a 5-step strategic marketing process. In it, the authors explain how comapnies can become better storytellers and create an emotional connection with customers, thus transforming fans into a community. These five steps spell the word for success in Spanish: É-X-I-T-O. First copies are scheduled to ship October 10, 2013. See options above to purchase with Latino Link (also by Joe Kutchera, in English) or to purchase two or more copies of E-X-I-T-O at discounted prices. Proceeds from Joe’s new book will benefit the non-profit One Laptop Per Child (OLPC), which provides solar-powered laptops to low-income children.